I'm thinking about the whole period: the design and planning, construction, and commissioning? I'd value real-world examples, to back up any numbers. I don't think that ports are a limiting factor here. Unless you are planning on making millions of turbines all made from one port near a manufacturing facility. Let's suppose that you are building 100 meter turbines. That is 100 meter diameter air flow, on a 100 meter tower, plus foundation. You've got a large tube 100+ meters long, and 3 blades 50 meters long. This is a large but common size ocean barge. Indeed, it would likely carry several. Let's suppose that you do the final assembly in a factory with a straight line to a single dock. Now your loading facility is much like any facility for handling large components. (How do companies load pre-formed refinery towers.) While it would not be as quick as loading containers, I bet with practice you would be able to load one component every 30 minutes. 4 major components = 2 hours per turbine. 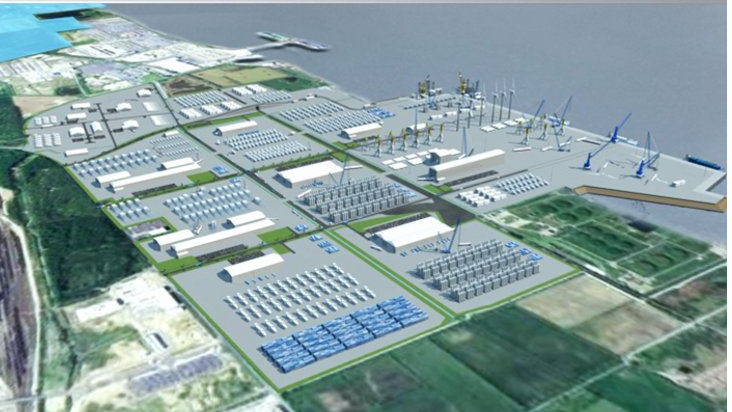 This would mean that one dock can handle 12 turbines per day, or about 4000 per year. Overall, your bigger problem is going to be getting them TO the dock, which is why a purpose build dock next to the factory makes sense. The dock facility can be build in tandem with the factory. Typical factory construction times are 1-3 years, depending on whether it's standard off the shelf tools, or high tech engineering.